On top of everything else, the kitchen isn’t even all that! This is crucial information, give that Home Again is a Nancy Meyers production. It’s impossible to watch a Meyers film, from Something’s Got to Give to It’s Complicated, and not be overcome with aspirational home décor FOMO. Her characters get to fall in love and use a kitchen consisting of gleaming silver pans, fresh-baked pastries, generous counter space and sun-drenched natural light. Alas, Reese Witherspoon is underserved in a rather ordinary, extensively tiled eatery. Chalk it up as one of the movie’s many letdowns. Home Again was never going to be earmarked for the 2018 Oscars. But these days, a sparkling mainstream romantic comedy comes around with only a tad more regularity than a solar eclipse. Unlike superhero movies and big-budget sequels, the genre is far from a guaranteed money machine. 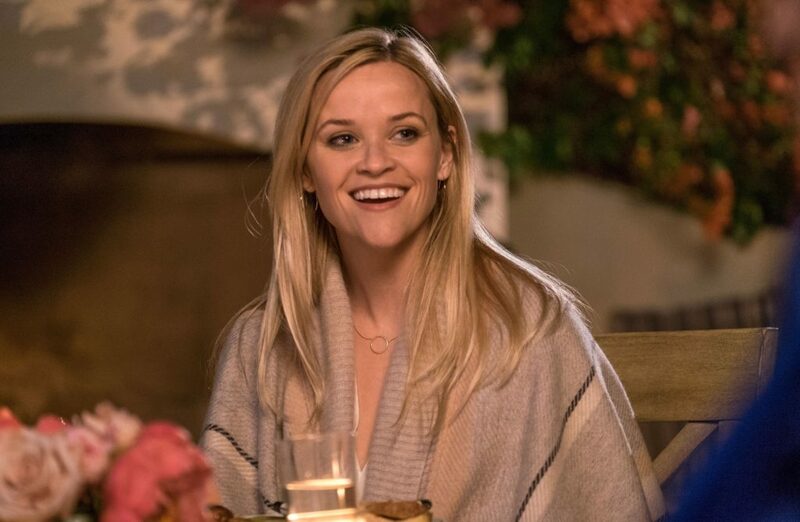 That’s why the thought of a Witherspoon vehicle driven by Meyers (her daughter, Hallie Meyers-Shyer, wrote and directed in her debut; Nancy coproduced) brimmed with fun promise. I’m a closet fan of lightweight. Lightweight can be an escapist delight — especially if vino and popcorn are involved. Thinly drawn characters drifting through a preposterous story is another matter entirely. Witherspoon’s Alice is a typical Meyers heroine in the sense that she’s gorgeous, wealthy, effervescent, clean cut and obliviously residing in the bubble. Here, it’s the L.A.-area bungalow once occupied by her late father, an Oscar-winning director. She and her two daughters just uprooted from New York City in the wake of a separation from her music producer husband (Michael Sheen). On the night of her 40th birthday, she goes out and flirts with three Millennial dudes (Pico Alexander, Jon Rudnitsky, Nat Wolff). They all go back to her house for a nightcap; she and the cutest one (Alexander) get it on in her bedroom until he starts puking. We all know what any smart, Type-A mother to two vulnerable girls would do next: Invite all three strangers to move in!!! Seriously. In the A.M., she learns that they’re recent transplants and aspiring filmmakers itching to strike it big in Hollywood. They’re in awe of her father’s legacy. When her actress mom (Candice Bergen) turns up to drop off the girls, they eat up her stories for breakfast. Mind you, everyone and their poodle in L.A. is in “the industry.” Alice is won over anyway. She offers up the guest house on the spot. Hilarity does not ensue. Eh, maybe a few chuckles. Nobody on the premises is ever offended or offensive, and a plastic bag of marijuana is flushed down the toilet on Day 1. Perhaps to justify the silly narrative, Meyers-Shyer seems more focused on showing how these guys care enough to run an adorable concierge service. One helps design Alice’s web site; one romances her; one forms a disconcertingly tight bond with her daughters. (I use “one” because the guys are indecipherable.) They all want to sell their script to a horror movie producer. None of the above is interesting. (Only Eli Wallach in The Holiday can pull off a charming inside-Hollywood subplot.) An actual conflict doesn’t arise until Sheen tries to win back his ex. It’s a forced development, hindered by Witherspoon and Sheen’s lack of chemistry. Were these two ever really married? The lovely Reese Witherspoon is ill-served by the weak script that pulls her in too many directions. In one moment, Alice is a shrinking violet getting bossed around by a shrewish client (Lake Bell, wasted). The next, she’s dropping her kids off to school, Big Little Lies-style. She’s never not frazzled, but she’s also not as lost as she thinks. When she claims, “I’ve never felt more alone and terrified in my whole life,” the remark is almost laughably disingenuous. Come on! You have a strong support system and a free spacious home. You’re going to be fine. So what if all her men pour on the TLC? If one of them just got blunt with her, I’d personally bring over the welcome mat. Better yet, she should be a real modern woman and be blunt with herself.